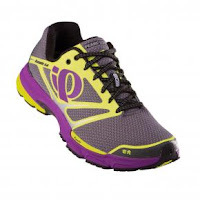 I first reviewed a pair of Pearl Izumi shoes last year and loved them. I honestly wear them all the time. They are called the Streak II and are now sold in different colors than the original ones I got. I love how lightweight they are and they have lasted a year without and tears or breakdown. This time around, I was sent the Kissaki II in gray/purple with yellow highlights. This is a new color of their shoe and it retails for $130. The shoes are lightweight but not as light at the Streak II shoes. Something to note is that these shoes run half a size smaller than others. I did not know this when ordering but somehow, they still fit. 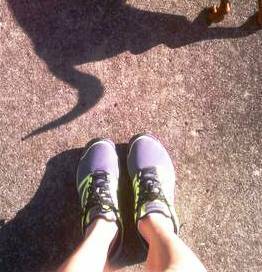 My new shoes with Jaxen, my dachshund, on a walk. They are very comfortable and so far, I have worn them walking, running and during a workout video. For all three activities, they were perfectly comfortable. I love the way that they look with the neon yellow and bright purple. I think that new running shoes are enough to motivate you to exercise and these are definitely cute enough to help me get motivated. If you have not worn Pearl Izumi shoes yet, I would highly recommend trying them.